Do you want to see Ron Howard's new F1 epic RUSH before anyone else? What about the rally documentary Easier Said Than Done? Do you want to play Gran Turismo 6 early? 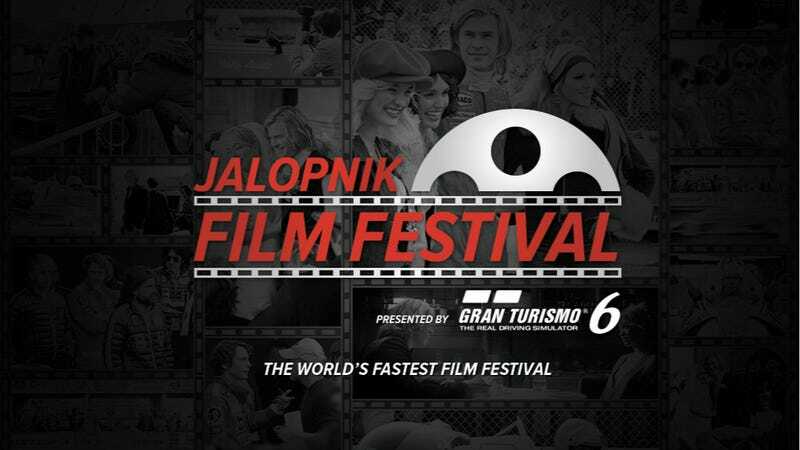 Then I'm excited to announce you'll be able to do all that and more at the first ever Jalopnik Film Festival, presented by Gran Turismo 6. Basically, what I'm telling you is you're invited to experience the biggest meeting of film and car culture in modern history. Maybe ever. There's so much to get excited about I can't even fit it all in one post, so I'm just going to give you a taste so you can put September 18th and 19th on your calendar. A month dedicated to cars and the cinema starts… NOW! A film festival that only Jalopnik could pull off. A film festival dedicated to cars and car culture. We'll not only show an assortment of important car films we'll also bring you directors, writers, performers, and other people involved in the world of cars and film. Oh, and there's going to be a giant party at the Classic Car Club Manhattan where you'll get the chance to rub elbows with all those important people. You'll know this as Ron Howard's new film taking on the 1976 Formula One season, starring Chris Hemsworth, Daniel Brühl and Olivia Wilde. It is the movie we're all freaking out about and, thanks to the genuine car people behind the film, we're showing it to the public before anyone. The documentary that moved us all to tears. The film that captivated audiences who'd never seen an F1 race before. The touching and tragic story behind legendary driver Ayrton Senna. A romp from a golden age of cinema and F1 starring James Garner, Eva Marie Saint, and a host of actual real life racing drivers. Directed by noted car enthusiast John Frankenheimer, it uses actual racing footage from era. Not only is the film an American take on the world of rallying, you all helped fund the film. This will be your first chance to see it. A documentary about one of the most Jalopnik cars ever this film by Jalopnik reader and NYC filmmaker Andrew Filippone Jr. is one I had in mind from the beginning when we had this idea. The after film panel will include Alex Nunez, Matt Farah, Patrick George, and the director. When And Where Is This Amazing Event? What: Cool people, GT6 simulators, party, panel, fun. It's ok, breathe. You'll be ok.
Who All Will Be Coming? That's a closely guarded secret for the moment, but you'll be impressed. We'll be announcing details next week, but I wouldn't be doing this if it wasn't going to be affordable and accessible for Jalopnik readers. The whole thing is presented by GT6, which is to say they are sponsoring it, which is to say a lot of this is being underwritten. Passes will be limited, so play close attention to this space. Also it means great access to the game and its creators… oops, I hope I didn't give too much away there. UPDATE: Tickets for sale here, while supplies last.